A substantial proportion of traumatology involves the maxillofacial region. Maxillofacial injuries can occur due to a number of etiological factors,, which in most instances determine the pattern and severity of the injury sustained to this area. The basic form of the maxillofacial region is determined by the hard tissues, while the skin, mucosa, and the underlying soft tissues in between create a soft-tissue envelope. These anatomical sites ultimately have been commonly used in epidemiological studies to classify the maxillofacial trauma. Injuries to this highly vascular zone are complicated by the presence of upper airway and proximity of the cranial and cervical structures that may be concomitantly involved. Many authors support the notion that maxillofacial trauma alone is rarely life threatening unless associated with airway compromise., Apart from the airway compromise, some other causes of the life-threatening complications following trauma to the maxillofacial region may be due to massive bleeding or undiagnosed cervical spine injury. However, there are situations in which some complications of the trauma may arise depending on not only the localization of the initial injury, but also from the treatment itself. Among these complications are the injury-associated syndromes. These syndromes can either be due to direct effect of the trauma that leads to entrapment/compression of vital structures or may be secondary to the consequence of other local and systemic body reactions to the stress induced by the trauma and/or its management. Literature search revealed few reported cases of syndromes associated with maxillofacial injuries; hence, this article aimed at conducting a narrative review of these rare conditions which can otherwise in some instances be overlooked in general practice. The few encountered syndromes in literature are thus discussed below, focusing on the pathogenesis and clinical presentation. Anatomically [Figure 1], the SOF, which is a pear-shaped structure with the broadest part at the nasal side, is bound laterally by the greater wing of the sphenoid, medially by the lesser wing of sphenoid, and superiorly by the frontal bone, lying at the apex of the orbit and at the border between the roof and the lateral orbital wall. The SOF serves as a pathway that allows communication between the orbit and the middle cranial fossa, thereby transmitting the oculomotor, trochlear, and abducens nerves (cranial nerves III, IV, and VI), as well as the first three branches of the trigeminal nerve: the frontal, lacrimal, and nasociliary nerves. Two pathogenetic mechanisms can be identified; the direct, which is when the nerves traversing the fissure are interrupted or compressed by displaced bone fragments., The second is indirect mechanism, in which the orbital walls behave like a nonexpandable box, so every increase in internal orbital pressure caused at the moment of the injury by posterior displacement of the eyeball or later by edema and bleeding may compress the nerves against the rims of the fissure., The symptoms following the mechanisms described may either be complete or partial depending on the degree of compression of anatomical structures. SOFS is an uncommon complication after craniofacial trauma and is usually due to bony injury, foreign bodies, or hemorrhage at the orbital apex. It is a rare condition that may accompany facial fractures of the Le Fort types II and III, frontobasal skull fractures, zygomatic fractures, and orbital fractures. The reported incidence of traumatic SOFS is only 0.3%–0.8%, with incidence of traumatic OAS being much lower. SOFS and OAS have been documented in few articles, most of them being case reports. Deda andDemirci reported on the case of SOFS in a 25-year-old male who had zygomaticomaxillary complex (ZMC) fracture following an automobile accident. In another case report, Evans et al. described a case of a 44-year-old man who fell down concrete steps who was as well diagnosed with ZMC fracture with associated SOFS. In another case study, a 41-year-old man was diagnosed with SOFS after he was shot in the face with a handgun and sustained multiple comminuted fractures of the left orbit, with the bullet lodged near the SOF. The SOFS is not always associated with trauma directly, but at times as a complication of management of facial bone fractures, as described in a case report by Fujiwara et al. OAS is as well a rare condition that is associated with the maxillofacial trauma. Sugamata described two cases of OAS secondary to the fracture of orbit and, in both cases, the medial orbital wall was involved. Imaizumi et al., on the other hand, reported a case of traumatic OAS combined with the blow-in type of the orbital and ZMC fractures, in a 24-year-old male who sustained injury after a bicycle crash. The rarity of traumatic OAS, as well as traumatic SOFS, has made it difficult to define treatment guidelines for this condition. The rationale behind the treatment of SOFS of traumatic origin lies primarily in minimizing further irreparable damage to the neuronal structures. A general consensus lies toward the initial observation period of 10–14 days before any surgical manipulation of fracture segments is done since it prevents any hazard of further hemorrhage and involvement of the orbital apex or injury to the other nerves. Varying doses of systemic corticosteroids have been advocated as treatment alone, or in conjunction with other modalities such as facial fracture reduction. Surgical intervention may be indicated in the presence of significant narrowing of the SOF from the displaced fracture fragment. In the cases of traumatic OAS, currently, the following three treatment options exist: observation alone, high-dose corticosteroids, and surgical optic canal decompression. The Claude Bernard–Horner's syndrome (oculosympathetic paresis), commonly known as Horner's syndrome (HS), is due to injury to the sympathetic chain running over the carotid vessels. It occurs when there is interruption of the oculosympathetic pathway which supplies sympathetic innervation to the sweat glands (ipsilateral body and face), dilator muscles of the eye, and retractor muscles of the upper and lower eyelids. Among the several causes of HS, trauma is also included, especially of the neck, shoulder, and chest wall.,,, Trauma has been documented to account for <1% of all cases of HS, and secondary to maxillofacial trauma may be a very rare phenomenon. Worthington and Snape reported a case of HS in a 17-year-old girl with cranial nerve involvement, as an unusual manifestation of skull base fracture in a patient with maxillofacial injuries. In this case, HS associated with basilar skull fractures is most likely caused by trauma to the postganglionic pericarotid plexus as it traverses the carotid canal within the petrous bone. Another case of HS associated with maxillofacial injury was reported by Pruett. The described case was of a 5-year-old child who sustained intraoral trauma while running with an object in the mouth, following injury; he was eventually diagnosed with HS secondary to blunt intraoral trauma to the internal carotid sympathetic plexus. Due to rarity of the cases of traumatic HS, its management is not well defined. Some authors have managed the condition by observation., However, when it is caused by the compression of the oculosympathetic pathway, the cause of the compression should be treated whenever possible. Orbital compartment syndrome (OCS) is a rare but potentially devastating ophthalmic emergency caused by a rise in intraorbital pressure (IOP) requiring emergent orbital decompression to preserve vision. Typically, an IOP >20 mmHg is considered elevated, and an increased IOP may compress the optic nerve directly or cause compression of its vasculature. The pathogenetic mechanism of OCS can be described in terms of a rapid rise in IOP that is beyond systolic pressure due to acute rise in volume within confined orbital spaces, causing a fall in perfusion below the critical level., Both the tissue and venous pressure increases when fluid (e.g. blood) enters a fixed-volume compartment. When these pressures exceed the capillary perfusion pressure, capillaries will collapse, thereby causing ischemia to muscles and nerves. The exact mechanism of damage to various nerves and their branches is unknown. Direct compression and impairment of blood supply to the nerves have been proposed as the possible mechanisms. In case of retrobulbar hemorrhage, the globe is displaced anteriorly to the extent allowable by the canthal tendons (and to a lesser degree, the prolapse of bulbar fat). Anterior displacement squeezes the globe between the immobile eyelids and the expanding hematoma. When anterior displacement of the globe reaches the limits of its anatomical restraints, intraorbital and intraocular pressures can go up precipitously, leading to permanent damage to the optic nerve. The result of OCS may be central retinal artery occlusion, anterior ischemic neuropathy, and blindness, if not reversed emergently. Clinically, patients typically present with acute visual acuity deterioration, diplopia, limited ocular movements, pain, proptosis, periocular edema, and ecchymosis, over minutes to hours. Despite previous animal studies demonstrating permanent retinal damage after 105 min of retinal ischemia, the duration before irreversible visual loss develops in human patients remains unclear,, though raised IOPs lasting for just 60–100 min can lead to permanent visual sequelae. Decreasing visual acuity (for all practical purposes, the vital sign of the eye) over time should be considered one of the most alarming factors. The most common cause of OCS is trauma. There are several published articles regarding the occurrence of OCS in patients who had sustained maxillofacial injuries. Sun et al. did a retrospective study of patients that presented with OCS secondary to blunt trauma. In their study, majority of the patients had sustained fracture of the orbit, with some having concomitant ZMC, and Le Fort I, II, and III fractures. Carrim et al., on the other hand, reported a case of a 27-year-old man who had been assaulted and received a direct blow to the left orbit. The patient was diagnosed with OCS, despite having no any obvious fracture of the facial bones. Kloss and Patel described a case of OCS in a 48-year-old male, who sustained facial and eye trauma after having been struck with a falling tree branch. In some cases, patients may develop OCS secondary to the management of facial bone fractures. Such an incidence was reported by Susarla et al. OCS is one of the few ophthalmic surgical emergencies whose diagnosis should be made clinically and treatment must be initiated immediately because of the risk of rapid, irreversible, vision loss. Computed tomography is commonly used to further evaluate the orbits as it is often immediately available unlike magnetic resonance imaging which often cannot be obtained in a timely manner. Lateral canthotomy is regarded as a first-line intervention for decompression of the orbit in OCS, and preferably, it should be performed within an hour or 2 h as it was suggested by some authors., Immediate lateral canthotomy and inferior cantholysis are recommended to prevent visual loss owing to optic nerve compression in OCS. The major goal of these external procedures is to reduce the IOP and reestablish retinal arterial blood flow by allowing anterior prolapse of the orbital contents. Carr et al. postulated that disintegration of the blood–brain barrier during neurotrauma allows the accumulation of leukocytes from systemic circulation including T-lymphocytes and macrophages, which in turn induce native glia to function as antigen-presenting cells. Activated microglia act as scavenger cells and remove posttraumatic neuronal debris, and thus present certain neuronal cell components as antigens to the immune system. The most frequently encountered clinical picture consists of relatively symmetrical muscular weakness that begins distally in the lower limbs, followed a few days later by the involvement of more proximal muscles such as those of the trunk, neck, and face, hypotonia, hyporeflexia, or areflexia, paresthesia, and opthalmoplegia., GBS is highly diverse with respect to the presence, distribution, and extent of cranial nerve deficits, sensory symptoms, weakness, ataxia, pain, autonomic dysfunction, and the course of the disease. Although a range of infectious factors are associated with GBS, it has also been reported to be triggered by noninfectious factors such as trauma, as described by Li et al., who reported several cases of GBS in trauma patients. Though it is very rare, maxillofacial trauma has also been documented to trigger GBS. Lin et al. reported a case of GBS in a 22-year-old female patient who sustained panfacial injuries following motor traffic crash. In this case, the symptoms of GBS became apparent 10 days postinjury. In another case report, Carr et al. reported a case of posttraumatic GBS in a 58-year-old man who sustained multiple facial bone fractures and traumatic brain injury after he was hit by a falling branch of a tree. The patient developed signs and symptoms of GBS on day 24 postinjury. Samieirad et al. reported a case of a 39-year-old female who presented with symptoms of GBS 3 days after surgical fixation of her mandibular fracture. Frey's syndrome, also called gustatory sweating or auriculotemporal syndrome, is a rare disorder that comprises of facial sweating and flushing of the parotid region initiated by gustatory stimulus., This condition is attributed to direct damage of the auriculotemporal nerve. The more acceptable theory is called the Theory of Aberrant Regeneration by André Thomas, which is based on defective nervous regeneration. Due to trauma, the postganglionic parasympathetic fibers of the auriculotemporal nerve supplying the parotid gland are sectioned. In addition, the sympathetic fibers that supply local sweat glands are also interrupted. It is believed that the severed parasympathetic fibers regenerate and connect with severed distal sympathetic nerves that innervate subcutaneous sweat glands. The misdirection of regenerating parasympathetic fibers to denervated sweat glands and cutaneous blood vessels, consequently, causes salivation to be accompanied by flushing and sweating in the sympathetically denervated region of skin.,,,, Parasympathetic and sympathetic nerve fibers can undergo cross regeneration because both use acetylcholine as a neurotransmitter [Figure 3]. Clinically, this syndrome is characterized by episodes of warmth, flushing, sweating, and occasionally pain around the preauricular and temporal areas, when eating, smelling, thinking, or even dreaming about food.,, Stimulation of parotid gland consequently leads to concurrent stimulation of the sweat glands in the distribution area of the auriculotemporal nerve due to misdirectional regeneration of parasympathetic fibers. The method used to diagnose the syndrome is the Minor iodine-starch test, which involves painting the affected site with a solution containing iodine. When the painted area becomes dry, it is covered with starch, and the patient is asked to eat something sour to induce gustatory sweating, thus the skin area involved by Frey's syndrome turns purple when the sweat gland's secretions react with the starch and iodine. Various forms of treatment of Frey syndrome, both medical and surgical, have been tried with varying degrees of success. However, some patients are managed conservatively by an explanation of the condition and reassurance. Despite the fact that the syndromes associated with maxillofacial injuries are rare entities, they may lead to poor quality of life or even death. Regardless of the new technological developments in the field of medicine that have helped ease the situation, the diagnosis of these syndromes is eminently clinical. It is the presence of mind of emergency personnel and surgeons' timely intervention and sheer skill that eventually count. The management of these syndromes at large is a multipronged approach requiring a partnership between several departments and specialties. By summarizing the syndromes associated with maxillofacial injuries, this article will be helpful to the clinicians and surgeons to have a high-suspicious eye when they encounter a patient with maxillofacial injuries and thus think about management that goes beyond the treatment of obvious injuries. Salentijn EG, van den Bergh B, Forouzanfar T. A ten-year analysis of midfacial fractures. J Craniomaxillofac Surg 2013;41:630-6. Schneider D, Kämmerer PW, Schön G, Dinu C, Radloff S, Bschorer R, et al. Etiology and injury patterns of maxillofacial fractures from the years 2010 to 2013 in Mecklenburg-Western Pomerania, Germany: A retrospective study of 409 patients. J Craniomaxillofac Surg 2015;43:1948-51. Ardekian L, Rosen D, Klein Y, Peled M, Michaelson M, Laufer D. Life-threatening complications and irreversible damage following maxillofacial trauma. Injury 1998;29:253-6. Verbruggen K, Halewyck S. Long-term complications after facial trauma: Literature review. B-ENT 2016;Suppl 26:47-58. Rai S, Rattan V. Traumatic superior orbital fissure syndrome: Review of literature and report of three cases. Natl J Maxillofac Surg 2012;3:222-5. Shama SA, Gheida U. Superior orbital fissure syndrome and its mimics: What the radiologist should know? Egypt J Radiol Nucl Med 2012;43:589-94. Yeh S, Foroozan R. Orbital apex syndrome. Curr Opin Ophthalmol 2004;15:490-8. 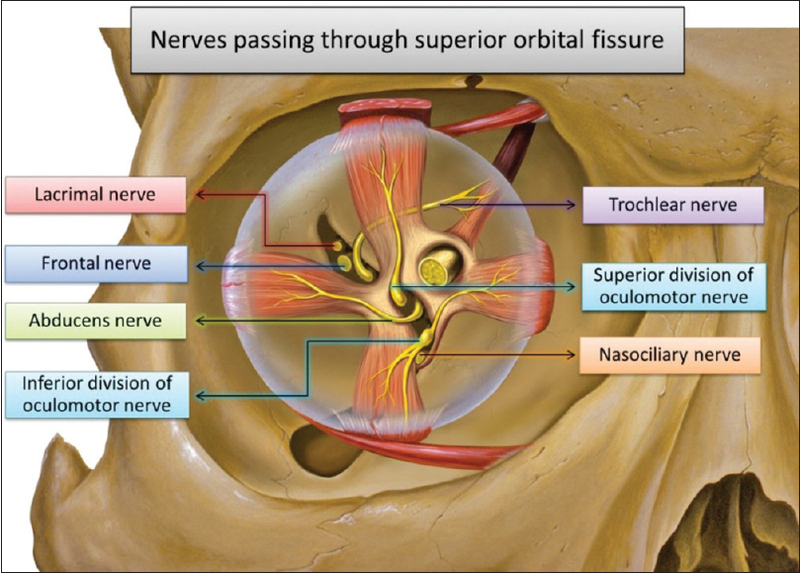 Chen CT, Chen YR. Traumatic superior orbital fissure syndrome: Current management. Craniomaxillofac Trauma Reconstr 2010;3:9-16. Evans HH, Wurth BA, Penna KJ. Superior orbital fissure syndrome: A case report. Craniomaxillofac Trauma Reconstr 2012;5:115-20. Deda H, Demirci I. Traumatic superior orbital fissure syndrome: Case report. Turk Neurosurg 2002;12:124-7. Jardim EC, Faverani LP, Masocatto DC, Oliveira MM, Kaba SCP, Junior EG, et al. Superior orbital fissure syndrome after facial trauma. Arch Health Invest 2017;6:245-9. Gupta R, Khan YA. Traumatic orbital apex syndrome. Can J Ophthalmol 2015;50:e8-11. Imaizumi A, Ishida K, Ishikawa Y, Nakayoshi I. Successful treatment of the traumatic orbital apex syndrome due to direct bone compression. Craniomaxillofac Trauma Reconstr 2014;7:318-22. Gabikian P, Chowdhary AM, Kott B, Lazar DA, Britz GW. Isolated superior orbital fissure syndrome resulting from gunshot wound to the head. Curr Probl Diagn Radiol 2012;41:112-3. Fujiwara T, Matsuda K, Kubo T, Tomita K, Yano K, Hosokawa K. Superior orbital fissure syndrome after repair of maxillary and naso-orbito-ethmoid fractures: A case study. J Plast Reconstr Aesthet Surg 2009;62:e565-9. Sugamata A. Orbital apex syndrome associated with fractures of the inferomedial orbital wall. Clin Ophthalmol 2013;7:475-8. Thakur JS, Saluja M, Azad RK, Sharma S, Mohindroo NK, Sharma DR. Iatrogenic Horner's syndrome with abducent nerve paralysis after cervical schwannoma excision. Head Neck Oncol 2014;6:3-5. Reede DL, Garcon E, Smoker WR, Kardon R. Horner's syndrome: Clinical and radiographic evaluation. Neuroimaging Clin N Am 2008;18:369-85, xi. Kanagalingam S, Miller NR. Horner syndrome: Clinical perspectives. Eye Brain 2015;7:35-46. Kedar S, Biousse V, Newman NJ. Horner Syndrome. UpToDate. Published; 2017 Available from: https://www.uptodate.com/contents/horner-syndrome. [Last accessed on 2017 Oct 01]. Davagnanam I, Fraser CL, Miszkiel K, Daniel CS, Plant GT. Adult Horner's syndrome: A combined clinical, pharmacological, and imaging algorithm. Eye (Lond) 2013;27:291-8. Paiva WS, De Amorim RL, Tavares WM, Alho EJ, Jeng BP, Figueiredo EG, et al. Horner's syndrome after blunt cervical and chest trauma: Case report. Arq Neuropsiquiatr 2007;65:1037-9. Pruett RC. Horner's syndrome following intra-oral trauma. Arch Ophthalmol 1967;78:420-1. Worthington JP, Snape L. Horner's syndrome secondary to a basilar skull fracture after maxillofacial trauma. J Oral Maxillofac Surg 1998;56:996-1000. Sayan M, Celik A. The development of Horner syndrome following a stabbing. Case Rep Med 2014;2014:461787. Sun MT, Chan WO, Selva D. Traumatic orbital compartment syndrome: Importance of the lateral canthomy and cantholysis. Emerg Med Australas 2014;26:274-8. Mohammadi F, Rashan A, Psaltis A, Janisewicz A, Li P, El-Sawy T, et al. Intraocular pressure changes in emergent surgical decompression of orbital compartment syndrome. JAMA Otolaryngol Head Neck Surg 2015;141:562-5. Lima V, Burt B, Leibovitch I, Prabhakaran V, Goldberg RA, Selva D. Orbital compartment syndrome: The ophthalmic surgical emergency. Surv Ophthalmol 2009;54:441-9. Carrim ZI, Anderson IW, Kyle PM. Traumatic orbital compartment syndrome: Importance of prompt recognition and management. Eur J Emerg Med 2007;14:174-6. Donaldson J, Haddad B, Khan WS. The pathophysiology, diagnosis and current management of acute compartment syndrome. Open Orthop J 2014;8:185-93. Burns GD, DeLellis SM. MPAS P-C. Lateral canthotomy in orbital compartment syndrome: Special operations medics on the battlefield can save the eye. J Spec Oper Med 2008;8:54-7. Kloss BT, Patel R. Orbital compartment syndrome from retrobulbar hemorrhage. Int J Emerg Med 2010;3:521-2. Susarla SM, Nam AJ, Dorafshar AH. Orbital compartment syndrome leading to visual loss following orbital floor reconstruction. Craniomaxillofac Trauma Reconstr 2016;9:152-7. Li X, Xiao J, Ding Y, Xu J, Li C, He Y, et al. Clinical and electrophysiological features of post-traumatic guillain-barré syndrome. BMC Neurol 2017;17:142. Kim J, Choi HY, Lee YM, Kim JS. Posttraumatic guillain-barré syndrome immediately following a traffic accident. Korean J Spine 2017;14:121-3.
van den Berg B, Walgaard C, Drenthen J, Fokke C, Jacobs BC, van Doorn PA. Guillain-Barré syndrome: Pathogenesis, diagnosis, treatment and prognosis. Nat Rev Neurol 2014;10:469-82. Carr KR, Shah M, Garvin R, Shakir A, Jackson C. Post-traumatic brain injury (TBI) presenting with Guillain-Barré syndrome and elevated anti-ganglioside antibodies: A case report and review of the literature. Int J Neurosci 2015;125:486-92. Lin TM, Lee SS, Lin RT, Lai CS, Lin SD. Guillain-Barré syndrome following facial bone fracture. J Plast Reconstr Aesthet Surg 2006;59:543-6. Samieirad S, Khajehahmadi S, Tohidi E, Barzegar M. Unusual presentation of Guillain-Barré syndrome after mandibular fracture treatment: A review of the literature and a new case. J Oral Maxillofac Surg 2016;74:129.e1-6. Head VA, Wakerley BR. Guillain-barré syndrome in general practice: Clinical features suggestive of early diagnosis. Br J Gen Pract 2016;66:218-9. Li C, Wu F, Zhang Q, Gao Q, Shi Z, Li L. Interventions for the treatment of Frey's syndrome. Cochrane Database of Systematic Reviews 2015, Issue 3. Art. No. : CD009959. Rustemeyer J, Eufinger H, Bremerich A. 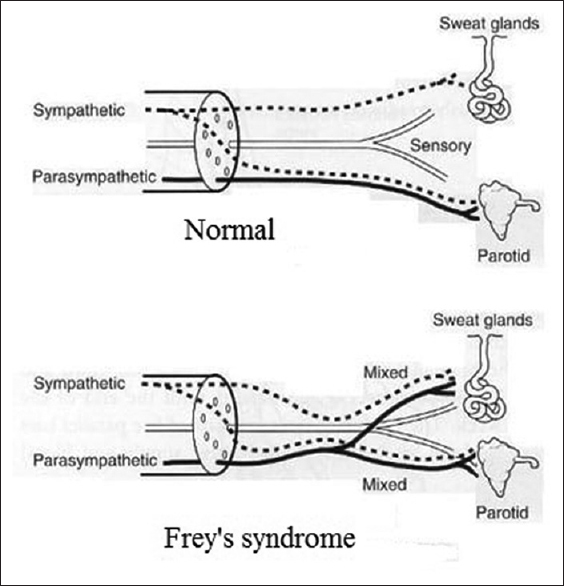 The incidence of Frey's syndrome. J Craniomaxillofac Surg 2008;36:34-7. Sverzut CE, Trivellato AE, Serra EC, Ferraz EP, Sverzut AT. Frey's syndrome after condylar fracture: Case report. Braz Dent J 2004;15:159-62. Kamath RA, Bharani S, Prabhakar S. Frey's syndrome consequent to an unusual pattern of temporomandibular joint dislocation: Case report with review of its incidence and etiology. Craniomaxillofac Trauma Reconstr 2013;6:1-8. Drummond PD. Mechanism of gustatory flushing in Frey's syndrome. Clin Auton Res 2002;12:144-6. 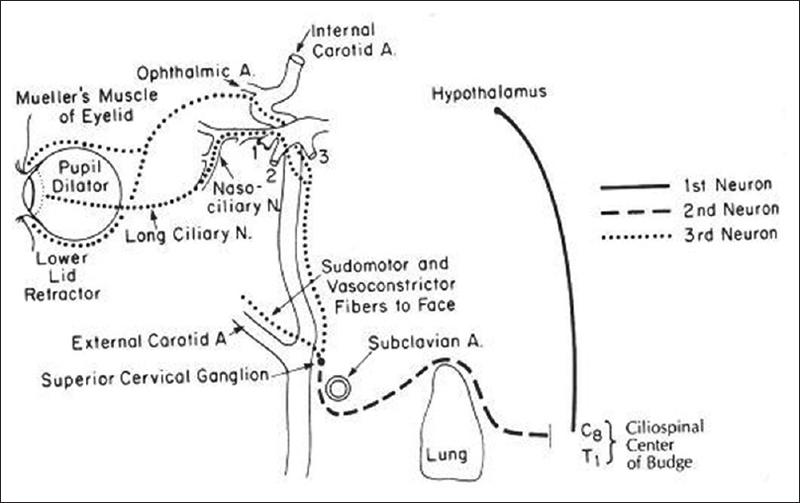 Segal K, Lisnyansky I, Nageris B, Feinmesser R. Parasympathetic innervation of the salivary glands. Oper Tech Otolaryngol Head Neck Surg 1996;7:333-8. Santos RC, Chagas JF, Bezerra TF, Baptistella JE, Pagani MA, Melo AR. Frey syndrome prevalence after partial parotidectomy. Braz J Otorhinolaryngol 2006;72:112-5. Cantarella G, Berlusconi A, Mele V, Cogiamanian F, Barbieri S. Treatment of Frey's syndrome with botulinum toxin type B. Otolaryngol Head Neck Surg 2010;143:214-8. Kragstrup TW, Christensen J, Fejerskov K, Wenzel A. Frey syndrome-an underreported complication to closed treatment of mandibular condyle fracture? Case report and literature review. J Oral Maxillofac Surg 2011;69:2211-6. Sengezer M, Sadove RC, Deveci M. Frey's syndrome following fracture of the mandibular condyle – A case report. Eur J Plast Surg 1997;20:217-9. Zöller J, Herrmann A, Maier H. Frey's syndrome secondary to a subcondylar fracture. Otolaryngol Head Neck Surg 1993;108:751-3. Goodman RS. Frey's syndrome: Secondary to condylar fracture. Laryngoscope 1986;96:1397-8. Mellor TK, Shaw RJ. Frey's syndrome following fracture of the mandibular condyle: Case report and literature review. Injury 1996;27:359-60.
de Bree R, van der Waal I, Leemans CR. Management of frey syndrome. Head Neck 2007;29:773-8. Martos Díaz P, Bances del Castillo R, Mancha de la Plata M, Naval Gías L, Martínez Nieto C, Lee GY, et al. Clinical results in the management of Frey's syndrome with injections of botulinum toxin. Med Oral Patol Oral Cir Bucal 2008;13:E248-52.